This week’s Fun Monday host is Gattina at Writer Cramps. She wants us to show a photo of our blogging place. I bailed out of last week’s Fun Monday (sorry to our friends at Mama Drama), because I didn’t have sufficient brain power to come up with an answer to their question. But I think this topic I can do. 🙂 You may have noticed that I enjoy taking photographs. So with that in mind, I give you My Blogging Space: The Sick Edition. This is me, LYING on the love seat with the computer on my legs. This entry was posted in Fun Monday, Ramblings on September 1, 2008 by ramblingsbyreba. Today’s Fun Monday is being hosted by Lisa at Lisa’s Chaos. She’s asked us to ask a question for our readers to answer. My question? 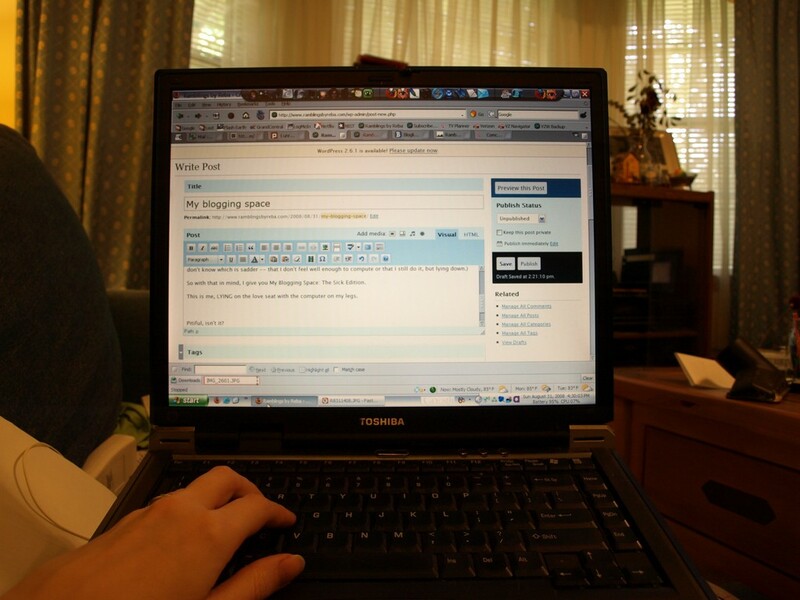 When did you start your blog? Nothing hard or particularly creative, but I’m curious how long people have been blogging. This entry was posted in Fun Monday, Ramblings on August 18, 2008 by ramblingsbyreba. Today’s Fun Monday is being hosted by The Lurchers. The assignment is to show our favorite photo and tell why it’s our favorite. It’s been a year since we got our new camera. Getting a digital SLR, which I’d wanted for YEARS, is what I consider the rebirth of my lifetime love affair with photography. I’ve taken most of the 40,000+ photos we’ve put on the camera. So I’m going to tell you my favorite photo from the last year. Well, to be more specific, I’m going to tell you my favorite photo since mid-October, when I got a Flickr page. This was HARD. I can remember taking most of the photos, so deciding felt like choosing a favorite child must feel. I could have picked the yellow flowers. The trip we were on when I took it was the first time I really started using the manual settings on my camera. The photo of Stone Mountain Lake in February was one of the first times I got down on the ground to get the shot. The photo of Ed taken last October at Irene’s was a first time I’d taken photos of people and was pleased with the result. But I’m not choosing any of those. 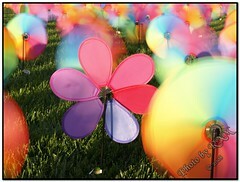 Instead I chose the photo of the pinwheels. It’s my favorite because I wanted to capture the pinwheels spinning and figured out how to get the shot. It’s my favorite because i noticed the “still” pinwheel amid all the spinning ones and framed the shot well. It’s my favorite because I didn’t crop it, color correct it, do anything to it. But mainly it’s my favorite because it makes me HAPPY to look at it. And isn’t evoking an emotion the point of photography? I think so. Oh, if you’re curious, I had my husband look at my finalists, because I was curious what his favorite was. He mentioned the photo of Fox barking, the swan swimming away from the camera, and the ponytail grass and yellow yarrow. But his favorite was the mother and baby goose. 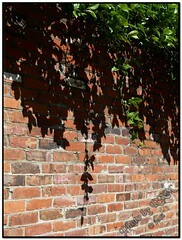 This entry was posted in Fun Monday, Photography, Ramblings on August 11, 2008 by ramblingsbyreba. This week’s Fun Monday host is Mothers of Brothers. The topic is favorite words. All definitions are from Merriam-Webster.com. So tell us all some of your favorite words. This entry was posted in Fun Monday, Ramblings on August 4, 2008 by ramblingsbyreba. Irish Coffeehouse is hosting this week’s Fun Monday. The topic is a GREAT one: careers — then and now: what we wanted to be when we grew up and what we’d do NOW if we had our druthers. When I was a little girl, I wanted to be a number of things. The two I can best remember are teacher and news anchor. My first clue that journalism was a better fit than media communications should have been the fact that I didn’t have a CLUE why people in my media communications major (primarily older than I was) were so freaked out by a class called Writing and Reporting the News. The professor (the previously mentioned future adviser) was known to be tough, and he made people have a lot of sources for the stories we wrote. (The HORROR!) In high school, I had to have answers to 50 questions for any newspaper story I wrote. What was the problem with having to have lots of sources? I took my journalism classes and media communications classes and graduated with a double major. At the end of my second internship at a t.v. station about 25 miles from my college, I ended up deciding that t.v. news was not for me. I knew that if I produced t.v. news I’d end up like Miles from Murphy Brown, swilling Maalox constantly. This realization came RIGHT before graduation. Good timing, no? That said, I still don’t know if journalism/publishing is what I want to be “when I grow up.” I say I’m only 33, so I have at least 20 years to decide. Go here for more Fun Monday posts and to sign up yourself. This entry was posted in Fun Monday, Ramblings on July 21, 2008 by ramblingsbyreba. I had so much fun participating in last week’s Fun Monday at Lisa’s place. After having such a good time, I signed up to participate in this week’s Fun Monday being hosted at U R Olive. The topic is fish stories. I thought she meant tall tales. But she meant stories about fishing in honor of the United States’ Fourth of July holiday. BUT then I remembered that I DID fish VERY occasionally, ending about 25 years ago. So I present to you my one and only fish story. This is one of those stories that doesn’t have a “tidy” way to end it, because I can’t remember much else about the day. I guess I’m not that good at telling fish stories. This entry was posted in Fun Monday, Ramblings on July 7, 2008 by ramblingsbyreba. Lisa at Lisa’s Chaos is hosting Fun Monday this week. I’m not sure exactly what Fun Monday IS or who started it and why. But this week’s topic, quirks, got my attention, so I thought I’d play. A quirk is defined as a peculiarity of action, behavior, or personality; mannerism. Yes, it would be easier to tell you what’s NORMAL about me. 🙂 I’ll give listing some of my quirks a shot, though. Let’s see. …but not the fact that a friend has had 8 inches cut off her straight hair. I can’t stand the sound of those tape dispensers one uses to tape up moving boxes. This has a lot to do with the fact that we moved every few years when I was a kid. But I don’t know of anyone else who actually shudders when hearing one. I know a TON about pregnancy, childbirth, breastfeeding and child rearing, but we don’t have kids or plan on having any. So tell me. What are some of YOUR quirks? This entry was posted in Fun Monday, Ramblings on June 30, 2008 by ramblingsbyreba.